Is it time for Lamar Jackson to take over for the Baltimore Ravens? 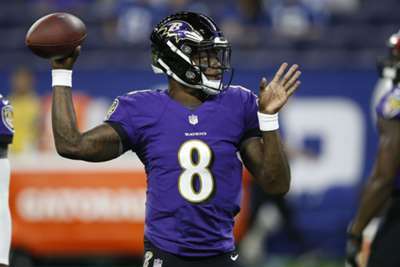 The 2017 Heisman Trophy winner will reportedly start on Sunday against the Cincinnati Bengals, as starting quarterback Joe Flacco is listed as doubtful with a right hip injury. Head coach John Harbaugh would not name a starter at practice on Friday. However, he did have good things to say about Jackson, who missed Thursday's practice due to illness, but was on the field a day later. "[He's a] very diligent, very smart, very aware quarterback," Harbaugh said, via ESPN. "He sees the game well, and … all the process that goes into just training that eye has been valuable. So, we have seen improvement, and in practice, he looks good." Jackson has completed 7 of 12 passes this season for 87 yards in special packages. He has also rushed for 139. The Ravens could also start another Heisman Trophy winner in former No. 2 overall pick Robert Griffin III. "They brought me here to be a pro; they brought me here to help this team if need be," Griffin said. "If my number is called, I'll be able to go out there and lead this team." The Ravens take on the Bengals in Baltimore on Sunday.